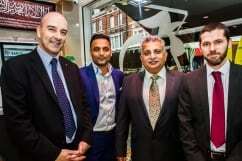 The family business was set up in 1965 and has been expanding across London for the past three years and now has over 70 staff and an average 1,500 customers a day. Tariq Halal sell a large selection of halal meat products, ranging from fresh, frozen, offal, marinated and chilled. They offer an exclusive frozen range and a unique selection of marinated items, such as chilli with chicken. The new shop will have extended operational hours and offer local delivery to restaurants. Ten jobs have been created so far, with five more people set to be recruited in 2015, the company reported.